Have you heard of the Time Out bottle? There is a photo that has been appearing on my Facebook feed. I just though, eh, nice photo, and kept scrolling. But it just kept appearing. Then a mum in the office cornered me today and said, "OMG, have you seen this?". What I didn&apos;t realise is that I had scrolled past the most ingenious parenting invention in the history of the world. I know. That&apos;s a big statement. But it is true. It&apos;s called the Time Out bottle. Or the calm bottle. Or the fairy bottle. It&apos;s called geniusness. Yes, that&apos;s a word. Say your kid is having a full blown melt down. I mean lying on the floor. Tears. Screaming. Banging fists. Just the thought makes me want to grab a bottle glass of wine for my inevitable future. You want to put them in a time out, right? But you know what will happen. They will continue the tears and the screaming. They may even demand to know how long they have to be there. You may or may not scream, "Until I decide". Which only makes them ask five seconds later if you&apos;ve decided yet. Enter the glorious Time Out bottle. MommyWantsFreebies.com explains that, "When you put your child in a time out, you give them this bottle which is full of glitter. When all the glitter settles down to the bottom, they are out of time out." "The reasoning isn&apos;t just a timer," MommyWantsFreebies.com explains. "It is so they can sit and watch it and calm down. We know that when we put a child in time out, they are pretty crazy, so it helps to calm them down. It also helps to teach them to think about what they&apos;ve done wrong and why they are in time out." MommyWantsFreebies.com says she found the idea on Pinterest from My Crazy Blessed Life. She blogged about her invention back in 2011 (which you can read here), but clearly it is so incredibly amazing that it&apos;s doing the rounds again. Watch the video to know how to make one of these genius tools. Post continues after the video. 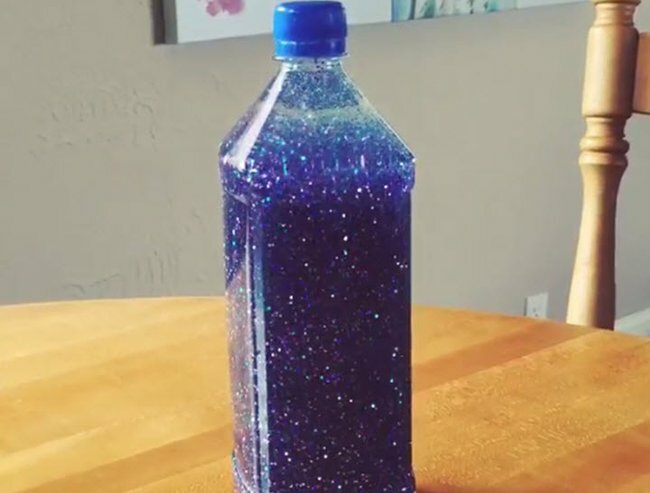 All you need to make one is a bottle without ridges, clear gel glue, fine glitter (your kid&apos;s favourite colour), super glue and some optional sparkly confetti. Fill the bottle up 4/5 of the way with room temperature water. Add some clear gel glue and the glitter. Shake like there is no tomorrow. If the glitter takes too long to settle, add more water. If it settles too quickly, add more glue. Add the confetti, if you want something additional for your kids to look out for. Once you&apos;re happy, super glue the cap on (the last thing you want is for your kid to unscrew the lid during a time out). Have you used the Time Out bottle? Does it work?